Fixing blistered paint is straight forward with a few differences between interior and exterior surfaces. All affected paint must be removed before applying a new layer of paint. For small areas, remove bubbles by scraping then sand the edges of the repair to create a smooth surface. This applies to smooth surfaces with out texture, like smooth wood siding. For rough surfaces, stucco and embossed masonite siding, only scraping and/or wire brushing is possible. Large areas of damaged finish can be removed by power sanding or hand scraping. Wood surfaces are best taken down to bare wood because old layers of damaged paint are major causes of blistering and peeling. On masonry, stucco or cinder block, pressure washing can remove the worst paint bubbles quickly, but it’s still a good idea to use a scraper or wire brush to help remove any remaining damage and smooth out the surface. Scraping is the most effective method of removing blistered paint on walls or ceilings. This damage will need additional steps to finish the repair. NOTE: In most cases it isn’t necessary to remove all of the paint. Concentrate on just the blistered or bubbled areas. If the current finish is less than 2-3 weeks old scraping could loosen additional paint near the affected spots. Paint applied less than 2-3 weeks ago is uncured and not fully adhered to the surface. After removing the paint blisters wipe the area with a clean cloth and fresh warm water to remove any residue. Apply a coat of shellac or oil base prime to seal the affected areas. At this point you could just touch-up with paint or go for a more complete repair. To complete the repair use a fast setting drywall mud or other spackling compound to fill the affected areas. Sand the repairs smooth upon drying, and retexture if needed to blend the repair with the surrounding surface. Always remember to prime repairs before painting. Most repairs can receive a good coat of oil based or acrylic primer. On unsealed concrete, use a sealer/primer combo. Look for the words “moisture blocking”, “vapor blocking”, or “vapor barrier” on the label. If mold or mildew has taken hold in a damp environment, remove it. Discolored areas can be treated with a stain-blocking primer once the repairs are complete. Apply primer and paint according to manufacturer recommendations (not too thick or too thin) and allow adequate drying time. This will help prevent new paint blisters and bubbles from forming. In some cases, this means waiting a full day or more between coats. Read labels if you’re unsure. As you are smoothing and repairing the affected areas, look for clues that might help determine the cause of bubbling. If the surface was previously unpainted, the cause is probably moisture. If fresh paint was applied over existing layers, heat or excessive thinning are likely culprits. Of course, applying paint to a dirty or greasy surface can also cause blistering. Be sure to correct any problems before repainting. Sounds like there is a chemical reaction or degassing of an older coating or stain. 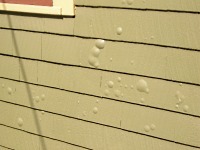 Here in Colorado Springs this happens on old homes with cedar shake or other wood siding. These homes were originally “stained” with a linseed oil+varnish+?? (sometimes coal tar for color) that was mixed on site. This stuff eventually is covered up with many layers of primer and paint. The old paint(s) is allowing the gasses out but the new paint is too stretchy and impermeable to these gasses. Plus, often the new color is darker than the original causing the siding to heat up in the sun, reactivating the old layers. Bubbling occurs then gasses or liquids try to escape and get blocked by the new paint. OK, with that said; The only remedy is to scrape off the bubbles then prime with an oil base wood primer, Zinsser Cover Stain works well, allow to dry then touch-up. You can also try a shellac primer like BIN. This might help but most likely this problem will persist for a while.